Every baker in Israel makes jelly doughnuts, or sufganiyot, for the eight days of Hanukkah. Traditionally, sufganiyot, were stuffed with jelly, but today innovative Israeli bakers fill them with Nutella, lemon curd, and even foie gras. We are fans of cherry jam and dulce de leche. I use a cupcake corer to cut a hole in the middle of the muffins, which is a lot more fun and easier and cleaner than using a knife. You can make great use of the cut-outs by dipping them in melted butter and sugar and serving bite-size “doughnut holes” alongside the doughnut muffins. 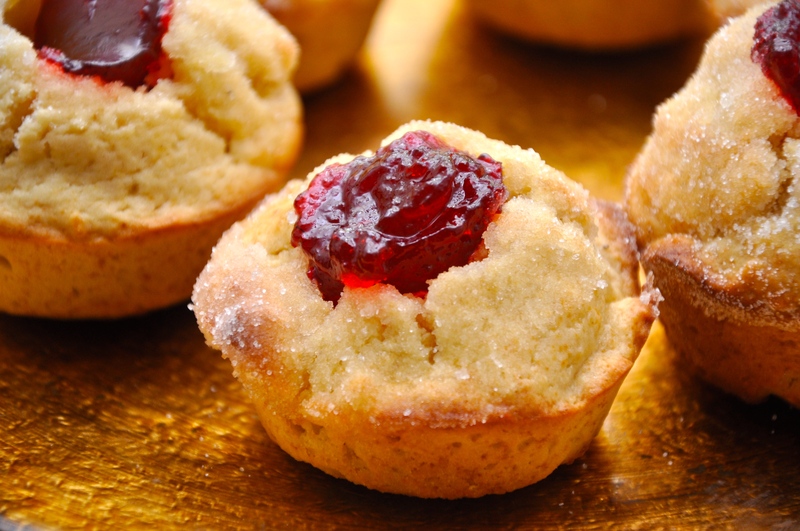 Every bite of these muffins is the ideal (miraculous) combination of sweet-cream-sugar-and jam. They are stupendous toasted. You will want to bake and eat them specifically for Hanukkah, and year round!